Not to be confused with Nationalism. Some manifestations of patriotism emphasise the "land" element in love for one's native land and use the symbolism of agriculture and the soil – compare Blut und Boden. An excess of patriotism in the defense of a nation is called chauvinism; another related term is jingoism. 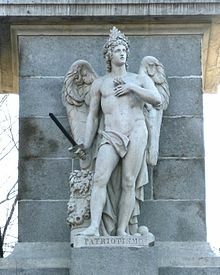 The English term patriot is first attested in the Elizabethan era; it came via Middle French from Late Latin (6th century) patriota, meaning "countryman", ultimately from Greek, Modern πατριώτης (patriōtēs), meaning 'from the same country', from πατρίς (patris), meaning 'fatherland'. The abstract noun patriotism appears in the early 18th century. The general notion of civic virtue and group dedication has been attested in culture globally throughout the historical period. For the Enlightenment thinkers of 18th-century Europe, loyalty to the state was chiefly considered in contrast to loyalty to the Church. It was argued that clerics should not be allowed to teach in public schools since their patrie was heaven, so that they could not inspire love of the homeland in their students. One of the most influential proponents of this classical notion of patriotism was Jean-Jacques Rousseau. Enlightenment thinkers also criticized what they saw as the excess of patriotism. In 1774, Samuel Johnson published The Patriot, a critique of what he viewed as false patriotism. On the evening of 7 April 1775, he made the famous statement, "Patriotism is the last refuge of the scoundrel." James Boswell, who reported this comment in his Life of Johnson, does not provide context for the quote, and it has therefore been argued that Johnson was in fact attacking the false use of the term "patriotism" by contemporaries such as John Stuart, 3rd Earl of Bute (the patriot-minister) and his supporters; Johnson spoke elsewhere in favor of what he considered "true" patriotism. However, there is no direct evidence to contradict the widely held belief that Johnson's famous remark was a criticism of patriotism itself. Patriotism may be strengthened by adherence to a national religion (a civil religion or even a theocracy). This is the opposite of the separation of church and state demanded by the Enlightenment thinkers who saw patriotism and faith as similar and opposed forces. Michael Billig and Jean Bethke Elshtain have both argued that the difference between patriotism and faith is difficult to discern and relies largely on the attitude of the one doing the labelling. Christopher Heath Wellman, professor of philosophy at Washington University in St. Louis, describes that a popular view of the "patriotist" position is robust obligations to compatriots and only minimal samaritan responsibilities to foreigners. Wellman calls this position "patriotist" rather than "nationalist" to single out the members of territorial, political units rather than cultural groups. Marxists have taken various stances regarding patriotism. On one hand, Karl Marx famously stated that "The working men have no country" and that "the supremacy of the proletariat will cause them [national differences] to vanish still faster." The same view is promoted by present-day Trotskyists such as Alan Woods, who is "in favour of tearing down all frontiers and creating a socialist world commonwealth." On the other hand, Stalinists and Maoists are usually in favour of socialist patriotism based on the theory of socialism in one country. In the European Union, thinkers such as Jürgen Habermas have advocated a "Euro-patriotism", but patriotism in Europe is usually directed at the nation-state and more often than not coincides with "Euroscepticism". Several surveys have tried to measure patriotism for various reasons, such as the Correlates of War project which found some correlation between war propensity and patriotism. The results from different studies are time dependent. For example, patriotism in Germany before World War I ranked at or near the top, whereas today it ranks at or near the bottom of patriotism surveys. Since 1981, the World Values Survey explores people's national values and beliefs and refer to the average answer "for high income residents" of a country to the question "Are you proud to be [insert nationality]?". It ranges from 1 (not proud) to 4 (very proud). ^ a b Harvey Chisick (2005-02-10). Historical Dictionary of the Enlightenment. ISBN 9780810865488. Retrieved 2013-11-03. ^ "Nationalism (Stanford Encyclopedia of Philosophy)". Plato.stanford.edu. Retrieved 2013-11-03. ^ "Patriotism (Stanford Encyclopedia of Philosophy)". Plato.stanford.edu. Retrieved 2013-11-03. ^ "Organic gardening and farming". Organic Gardening and Farming. Rodale Press. 13: 109. 1966. Retrieved 2018-04-28. A country begins with its soil. A country must stand on its soil. Its people must love its soil. The soil is its basic capital. Patriotism means a love of one's soil [...]. ^ Bašić, Ferdo (2013). The Soils of Croatia. World Soils Book Series. Dordrecht: Springer Science & Business Media. p. 16–17. ISBN 9789400758155. Retrieved 2018-04-28. Soil is the Base of Croatian Natural Beauty and an Emotional Foundation of Patriotism! [...] Landscape is the 'emotional foundation' of patriotism and the feeling that man belongs to an area. A key function in its formation and maintenance is soil, because it determines landscape features and the benefits of options for possible forms of land use. Man has left 'impressions,' i.e., 'messages,' on the landscape. Changing the natural vegetation and entering into the space created by agriculture is the 'cultural landscape' created through natural conditions, which enriches this space [...]. [...] Fighting for survival, our hard-working ancestors, without any mechanization, prepared a 'flowing anthroscape' as a mute witness of past living conditions on Croatian islands [...]. ^ "Henry George Liddell, Robert Scott, A Greek–English Lexicon, πατρι–ώτης". Perseus.tufts.edu. Retrieved 2013-11-03. ^ Billig, Michael. Banal Nationalism. London: Sage Publishers, 1995, pp. 56–58. ^ Christopher Wellman, Professor of Philosophy at Washington University in St. Louis, and Professorial Research Fellow at Charles Sturt University in the Centre for Applied Philosophy and Public Ethics. ^ a b Wellman, Christopher Heath (2014). Liberal Rights and Responsibilities: Essays on Citizenship and Sovereignty. New York: Oxford University Press. pp. 32, 50. ISBN 9780199982189. ^ "Maddenation: Voltaire on patriotism". ^ "Communist Manifesto (Chapter 2)". Marxists.org. Retrieved 2013-11-03. ^ Motyl, Alexander J. (2001). Encyclopedia of Nationalism, Volume II. Academic Press. ISBN 978-0-12-227230-1. ^ Morse, Adair (2011). "Patriotism in Your Portfolio" (PDF). Journal of Financial Markets. 14 (2): 411–40. doi:10.1016/j.finmar.2010.10.006. Archived from the original (PDF) on November 25, 2011. Look up patriotism in Wiktionary, the free dictionary. 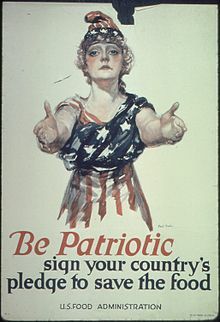 Wikimedia Commons has media related to Patriotism. Wikisource has the text of the 1921 Collier's Encyclopedia article Patriotic Societies. Charles Blatberg, From Pluralist to Patriotic Politics: Putting Practice First, Oxford University Press, 2000. ISBN 0-19-829688-6. Craig Calhoun, Is it Time to Be Postnational?, in Ethnicity, Nationalism, and Minority Rights, (eds.) Stephen May, Tariq Modood and Judith Squires. Cambridge: Cambridge UP, 2004. pp. 231–56. Paul Gomberg, “Patriotism is Like Racism,” in Igor Primoratz, ed., Patriotism, Humanity Books, 2002, pp. 105–12. ISBN 1-57392-955-7. Johan Huizinga, “Patriotism and Nationalism in European History”. In Men and Ideas. History, the Middle Ages, the Renaissance. Transl. by James S. Holmes and Hans van Marle. New York: Meridian Books, 1959. Alasdair MacIntyre, 'Is Patriotism a Virtue? ', in: R. Beiner (ed. ), Theorizing Citizenship, 1995, State University of New York Press, pp. 209–28. George Orwell, "Notes on Nationalism" in England Your England and Other Essays, Secker and Warburg, 1953. Gilbert K. Chesterton 1922 that America is "the only nation in the world that is founded on a creed. That creed is set forth with dogmatic and even theological lucidity in the Declaration of Independence." John Witherspoon The Dominion of Providence Over The Passions of Man, Princeton May 17, 1776. ^ 11 – Is it time to be postnational? – University Publishing Online. Ebooks.cambridge.org. 2004. doi:10.1017/CBO9780511489235. ISBN 9780511489235. Retrieved 2013-11-03. ^ "George Orwell: Notes on Nationalism" (in Russian). Orwell.ru. Retrieved 2013-11-03.